Guests of Akan Yuku no Sato Tsuruga are first greeted in lobby by the sight of two magnificent Japanese red-crowned crane carvings made by local master wood carver Masamitsu Takiguchi. Revered by the local Ainu people as the deity of the marsh, the Japanese red-crowned crane is also the namesake of the Tsuruga Group. The character “Tsuru” means crane while “Ga” means elegant. Much like these elegant and symbolic wooden carvings, the charms of the Group’s first hotel Akan Yuku no Sato Tsuruga can be found in its fusion of traditional Japanese aesthetics with Lake Akan’s own unique location and culture. The hotel’s traditional hot springs include a total of 33 different baths. The first floor main bath area known for its outdoor garden bath located flush with Lake Akan features a richly traditional Japanese-inspired design. From the rustically appointed eighth floor view bath and sky bath, guests are treated to the same magnificent panorama of Lake Akan as the mythical deities of the area might have once gazed upon. Guests can also experience fine dining that takes full advantage of the fresh, rich and bold local ingredients from Hokkaido has to offer. 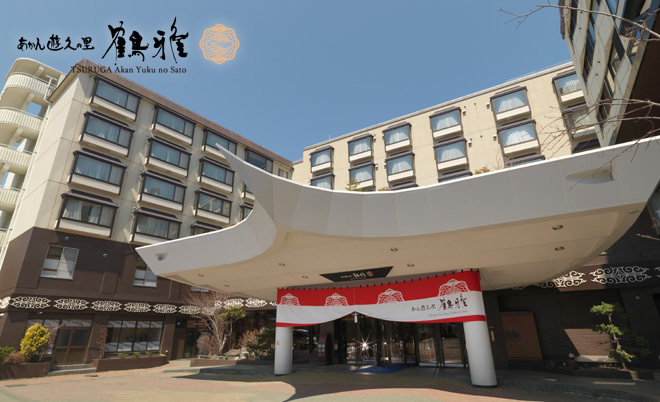 The hotel’s restaurants include a buffet-style restaurant and traditional Japanese kaiseki restaurant serving multi-course dinners. Designed with comfort in mind, guestroom designs incorporate Japanese aesthetics with the rustic charm of the Lake Akan area and are available in a variety of unique types and layouts. Akan Yuku no Sato Tsuruga is committed to making your guest experience one you will never forget. Visit us to experience the truest sense of warm, traditional hospitality that has been passed down for generations in this the great north of Japan.